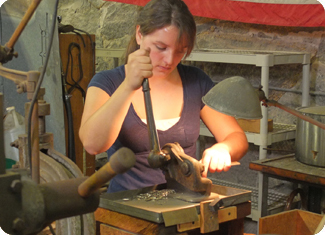 Silversmith Chloe Darke working at Old Newbury Crafters, Mark Markley photograph. Chloe Darke produces hand-wrought silver place settings for Old Newbury Crafters in Massachusetts, where her daily work reinforces and informs her personal work, which centers on the female form and aesthetic. Sculptor Albert Paley in his Rochester, NY studio, Mark Markley photograph. 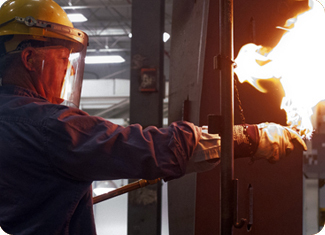 Albert Paley is ranked among the most successful and prolific sculptors in America, and his work has evolved through time and technology to a monumental scale. From the first mental image, to drawings, to cardboard models, to CAD (computer-aided design) maquette, to final multi-story welded steel sculpture, the hand is still his most important tool. Join Paley as he prepares for Paley on Park Avenue, the most ambitious project of his 50-year career. 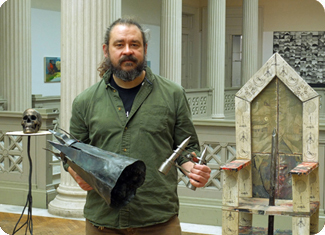 Veteran and artist Tom Pullin with his work at the Corcoran Gallery of Art, Mark Markley photograph. Tom Pullin served in the U.S. Army for almost 25 years and he brings his team-oriented service background to his art. Elemental and visceral, the practice of metal forging empowered him to make peace with a haunting, emotional past, as the act of “making” is itself healing.